This area is designed to highlight the characteristics of each window style. Selecting a window style to see more similar windows. 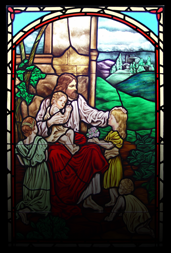 Lynchburg stained glass studio is a full service stained glass studio offering custom designed religious stained glass church windows. We provide a turn-key window system including aluminum frames and clear protective laminated storm coverings. Our One Studio … Many Styles… philosophy alludes to our diverse range of artistic style from hand painted traditional to modern contemporary. Our leaded stained glass windows are handcrafted using time-proven techniques passed down through generations of stained glass artisans. We also specialize in stained glass restoration, repair, protection, and window frame replacement–millwork or aluminum. We offer geometric opalescent window designs with hand painted “Life of Christ” scenes or new/old testament symbol medallions. 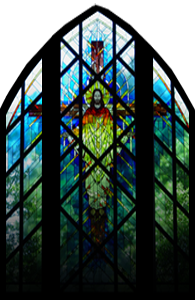 Our religious stained glass church windows are custom designed to suit each individual project. Lynchburg Stained Glass produces stained glass using time-proven traditional methods. All of our artwork is created in-house by our staff of artists and designers skilled in all styles of glass design and hand-painting techniques. 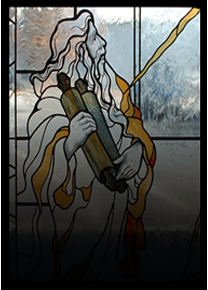 We offer both leaded and faceted stained glass windows and maintain a large glass inventory to expedite fabrication.We also specialize in stained glass restoration repair protection. Projects range from a few broken pieces to major re-lead restoration. Our large studio, located in Virginia, provides stained glass restoration to churches throughout America and abroad. Lynchburg Stained Glass Studio is a studio member of the Stained Glass Association of America, producing religious stained glass church windows. 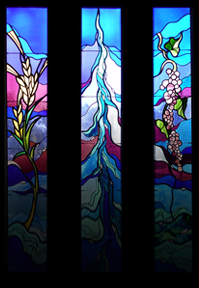 We will work with your church group and/or architect to plan and produce stained glass that speaks to both the church and community.